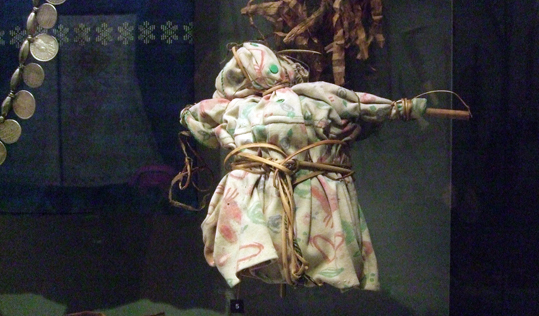 Doll ('kundu'), made of woven basket covered in a piece of clothing, and the whole enclosed in lengths of rattan. It is from the Palawan people, Palawan Island, Philippines. The Horniman Museum is full of wonderful magical items, including a whole display of charms from around the UK. 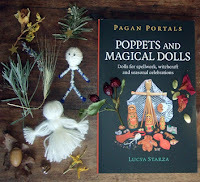 The staff in its library were also extremely helpful when I was researching my book Pagan Portals - Poppets and Magical Dolls, which is out this month. I thanked the Horniman Museum in the acknowledgements at the front. In the run-up to my book launch I have been blogging about magical dolls you can see in museums around England. These include Merrythoughts and Akua'Ba in the Museum of Childhood as well good luck dolls from the Museum of Witchcraft and Magic. My intention is to show that poppets aren't all about sticking pins and cursing! I'll be blogging about magical dolls in other museums over the next few weeks. You will be able to buy copies at Wicca Moon. You can also view Pagan Portals - Poppets and Magical Dolls on Amazon and order the book from Treadwell's.